Prepare for a career at the forefront of the motorsport industry on this academically challenging course. Prepare to make your mark in the highly competitive global motorsport industry. Offering exciting practical experience and strong employer links, our BEng (Hons) Motorsport Engineering with Foundation Year gives you a smooth route to success. Enhance your employability – we are ranked 15th highest among all UK universities and 12th for English institutions, with 96% of graduates in work or further study within six months of completing their degree: (HESA 2016). Set yourself apart as an innovative and resourceful motorsport engineer – ready to work with top teams or high-profile manufacturers. The foundation year will cover general concepts in areas such as engineering science, structural analysis and dynamics. It will also cover scholarship skills for technologists to assist your progress at honours degree level. You will gain a comprehensive understanding of topics such as advanced power train engineering, motorsport chassis design and computational fluid dynamics. We also expect you to take an active role in project work, whether designing supercharger applications or building your own telemetry equipment. We have a great range of vehicles and systems for you to study, from racing motorcycles to dragsters. We boast strong links across the industry, so you will keep up to date with what's new and next in the world of motorsport. 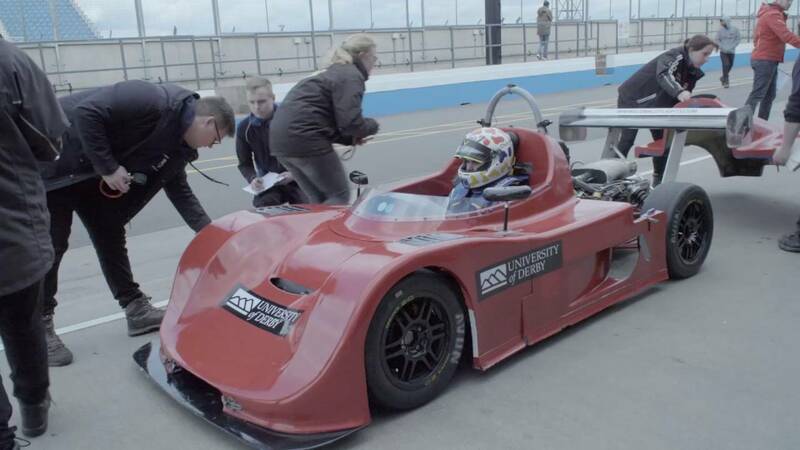 The course features regular guest lectures from companies such as Red Bull Racing, Bloodhound and Jaguar Land Rover through the IMechE Automobile East Midlands Division. Companies sometimes set interesting projects for our students too. We give you the opportunity to take part in a range of events where you can gain hands-on experience, including scrutineering and marshalling training, exhibitions and race meetings. Exciting projects like Formula Student - the world’s biggest student motorsport competition – could also become a highlight of your studies. Team Derby Motorsport entered this competition for the first time in 2015 and won the Formula Student Rookie Team Award. This success resulted in a £3,000 grant for the team from the IMechE. There are opportunities for you to go on an optional work placement as part of the BEng (Hons) Motorsport Engineering. The course also includes field trips to local race circuits for testing and visits to a number of exhibitions where you can strengthen your professional networks. You will also attend guest lectures as part of the annual IMechE series. Assessment is through a mixture of coursework assignments, examinations and formal presentations. Our focus is on ensuring you are work-ready and this course will give you the all the confidence and skills you need to progress directly into the international motorsport arena. Graduates have secured employment with companies like Cosworth, Zytec, JLR, Pirelli and EPM Composites. They have also raced all over the world and worked with international race teams in F1, GP2, FIA-GT and with a variety of national teams.